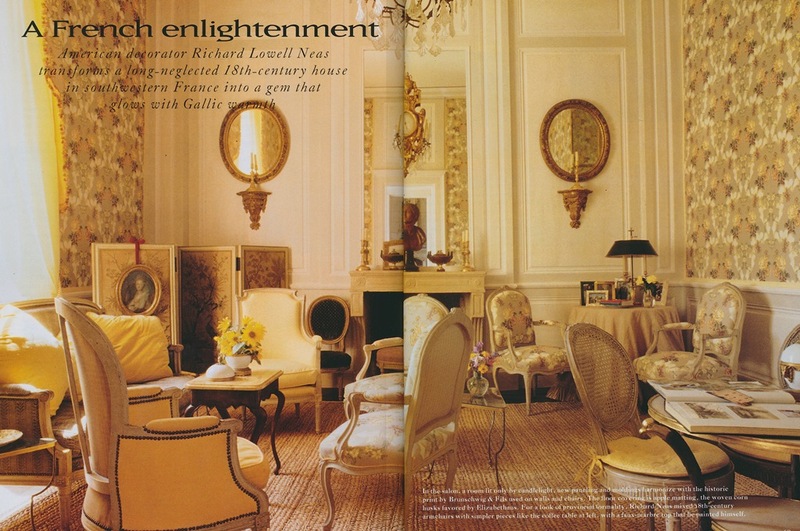 It's always a treat to stumble upon the work of the late decorator and decorative artist, Richard Lowell Neas. 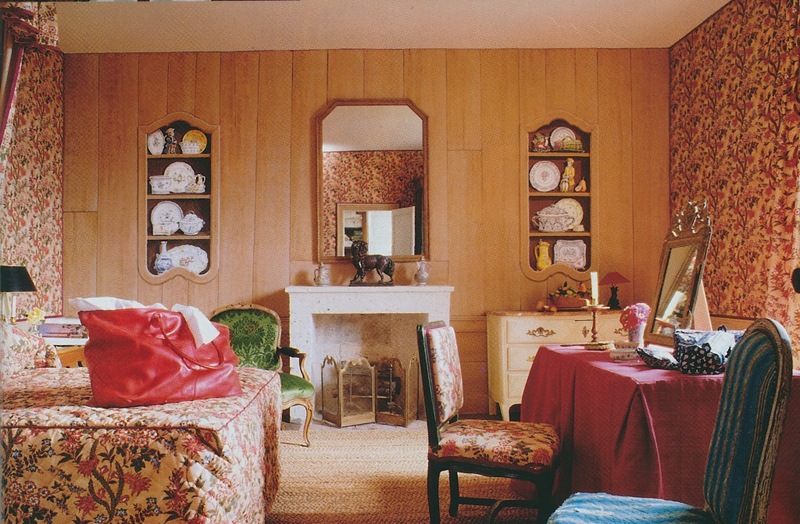 Over the years, I have collected photos of his Manhattan apartment as well as examples of his trompe l'oeil painting. What remained elusive to me, though, were photos of his much-admired home in southwestern France. 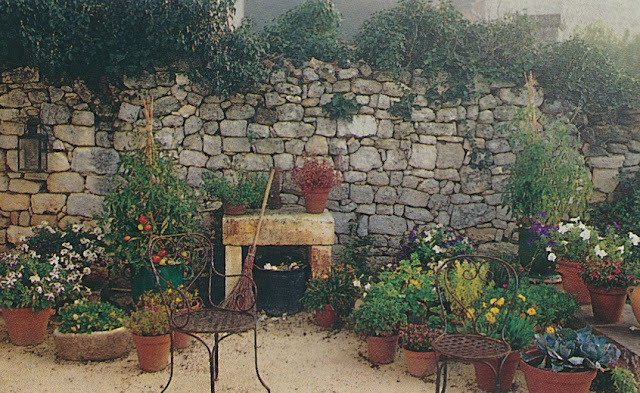 Thanks to a generous friend, who recently gave me a decade-worth of House Beautiful back issues, I finally have my hands on photos of Neas's charming French country house. 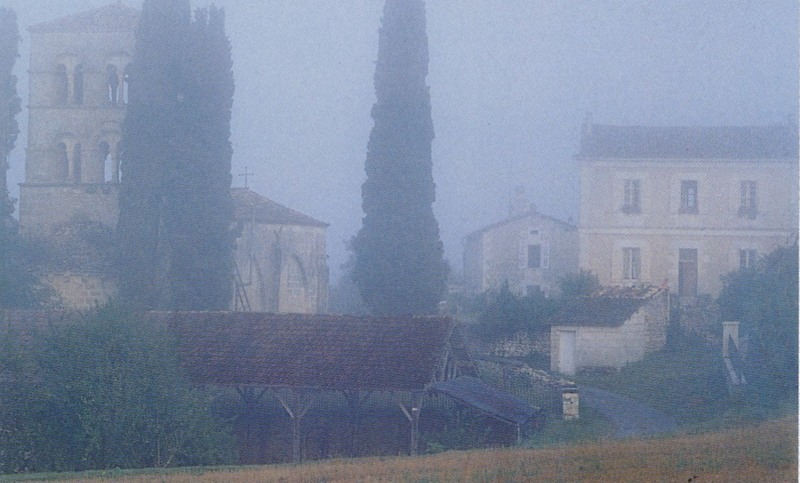 The c. 1770 stone house (see above), located in the town of Charente, was built for the village priest, which explains the structure's close proximity to a Romanesque church. When Neas found the house, it was in shambles. But rather than being deterred by the home's sad state, Neas saw it as an opportunity to breathe new life into an old home whose centuries-old structure remained mostly intact. 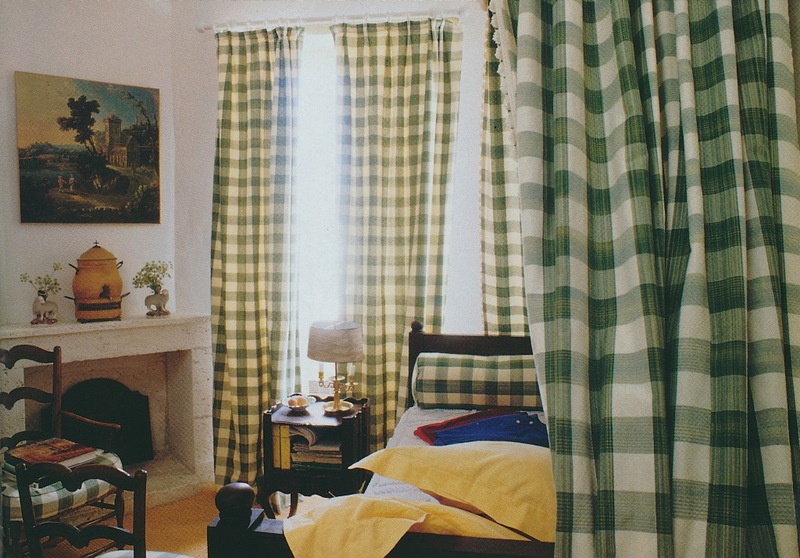 When I studied the photos of the home's décor, I was left with the impression that Neas must have reveled in creating his dream country house. The fabrics have a definite French flair (most of them were by Brunschwig & Fils, for whom Neas designed those now-famous trompe l'oeil papers, including Bibliothèque,) while the kitchen and pantry are like French country cuisine: earthy, yet well-seasoned, too. But what especially charms me are Neas's decorative jeux d'esprit, which can be seen throughout the house. That stone floor in the dining room? It's actually painted wood. And that wooden-clad guest bedroom? Its walls were painted to mimic wooden boards. The living room was like taking a step back in time. It was lit solely by candlelight, while the floor covering was apple matting, which was a favorite of Elizabethans. Like the painted floor, the dining room chandelier was meant to fool the eye. 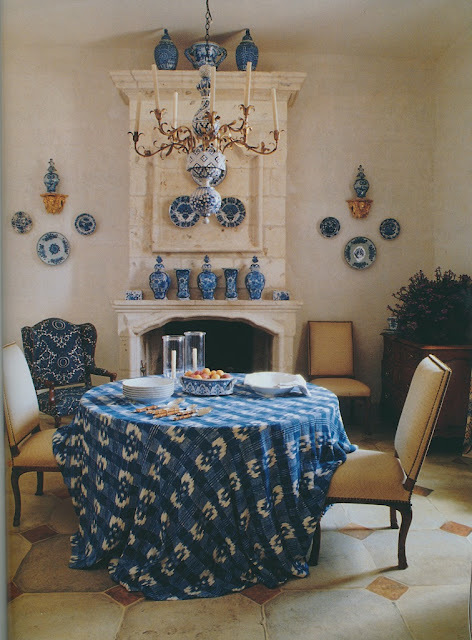 In fact, it was made of wood and painted to resemble blue and white ceramicware. 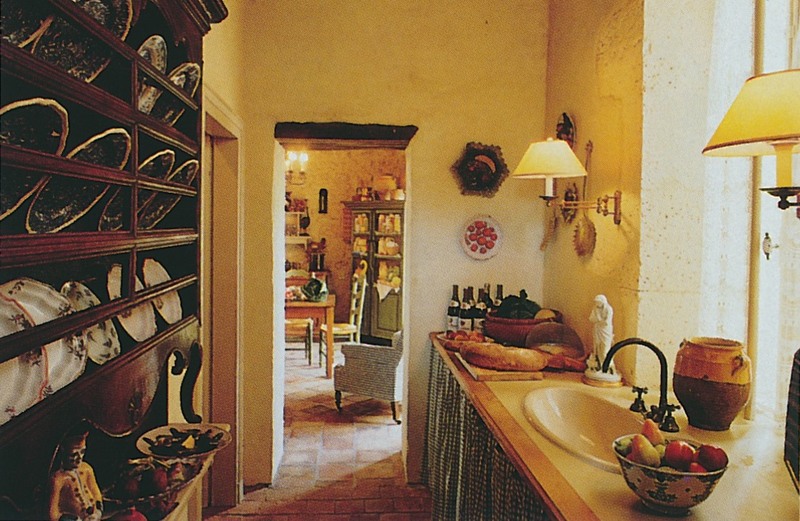 In the earthy kitchen, a trompe l'oeil painted cabinet hid the refrigerator. The pantry held Neas's collection of French earthenware, including what appears to be Aptware. 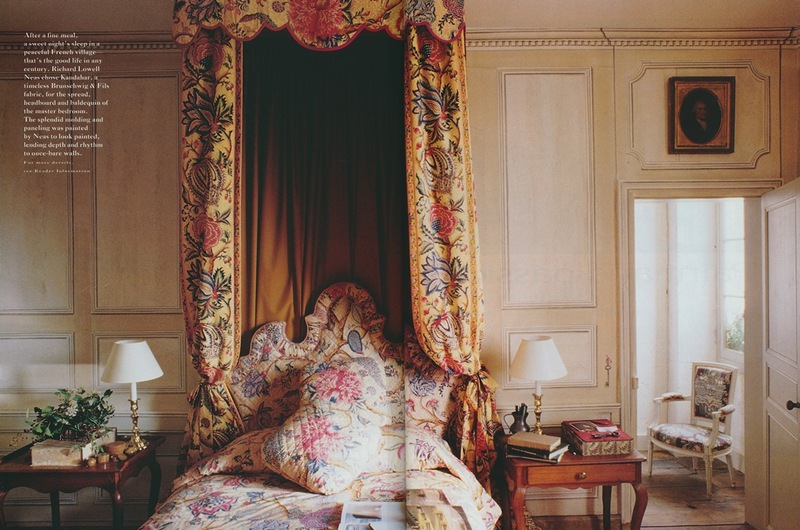 The centerpiece of the master bedroom was this canopied bed, which was lavished in Brunschwig & Fils' Kandahar fabric. The paneled walls are actually trompe l'oeil, as are the hanging key (painted to the left of the door frame) and the painting above the door. Another guest room with trompe l'oeil painted walls and niches. The dominant fabric was Mexicali by Brunschwig & Fils. 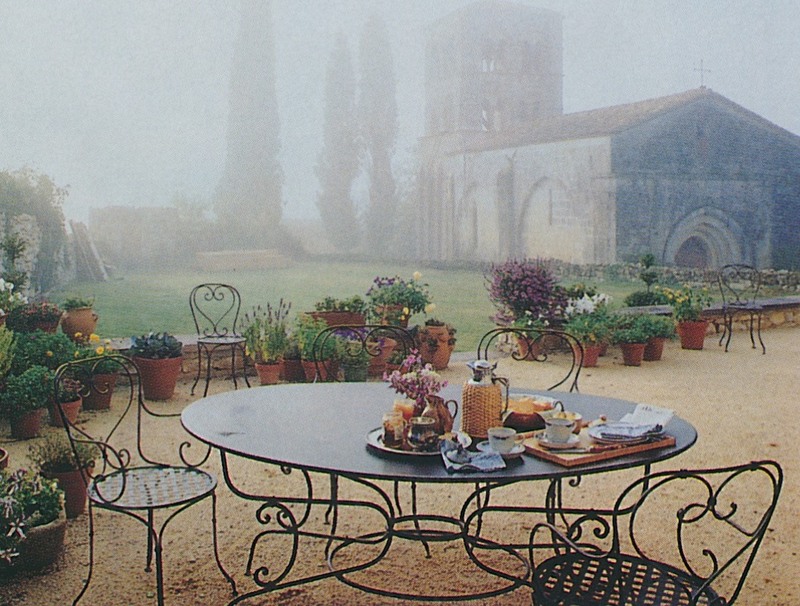 A view of the church from the terrace. And Richard was as nice as he was talented. To say he was a Francophile was an understatement, but after a large new house was constructed across from his in the Hamptons, dwarfing his house and blocking the view, Richard decided it was time to move to France. TDC, I think that he made a very wise decision. Love this! He certainly had a good eye for period detail. Cynthia, He certainly did, and yet, he also managed to keep the home from looking like a period piece. Wonderful Jennifer. I love his trompe l'oeil art so very much!! The dining room with the painted chandelier is wonderful! Love pictures of anything by Neas. He sometimes goes just up to, but never crosses, the border of preciousness. 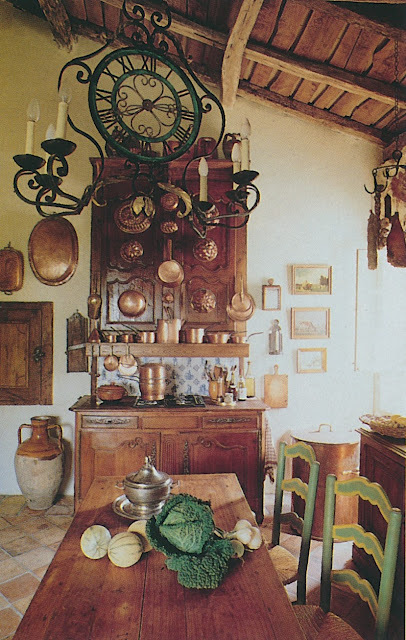 Does anyone know what that big copper bin in the corner of the kitchen is? Anonymous, I can't tell what bin is. It is rather large, isn't it? Looking at it again, it must be an enormous stockpot. That much copper wouldn't be used for anything that wasn't meant to be heated. What a delightful discovery! Thank you for sharing. The living room has a great palette and feels very 80’s/90’s as do some of the other rooms. I can't believe that the dining room chandelier was actually made of wood. It really looked like ceramic-made. I really can't move on from thinking about it. Thanks for this! I was Richards brother in law. The large cooper pot in the kitchen was a very old commercial cooking pot he used to hid his trash bin. 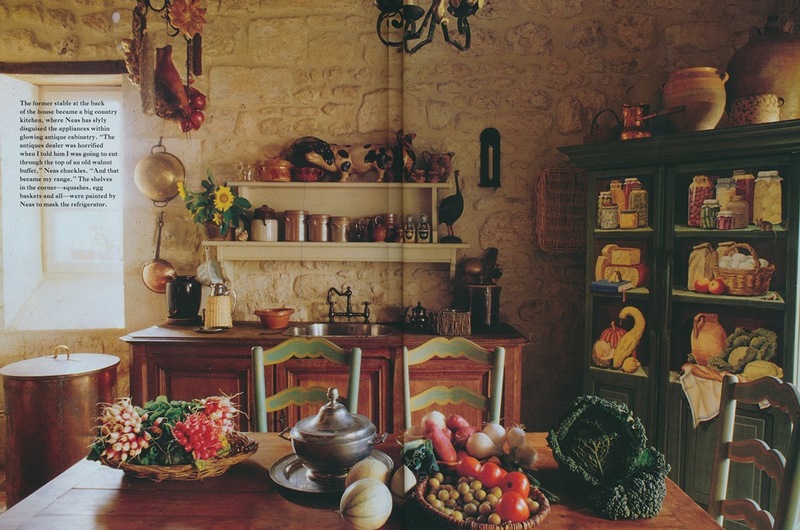 The small wooden door in the kitchen hid the oven. Every morning there was a loaf of bread delivered thru the kitchen window. This was a magical home to visit. Thank you so much for sharing, years ago, I attempted to paint my pantry door as his fridge was.....loved it so much!! Great inspiration....So happy you found it to post on here! !